Professor Mosunmola Omibiyi Obidike is at the leading edge of teachers and researchers in ethnomusicology in Nigeria, and the first female professor of music in sub-Saharan Africa. She was known not in music composition field but a pioneer of music education in Nigeria and abroad. Prof. Obidike was born on January 20, 1943 in Ibadan, OyoState, Nigeriato the family of Deacon John Otunla Omibiyi and Mrs. Ruth Mojirade Omibiyi. She was one of the students admitted to the Reagan Memorial Baptist Girls’ School, Yaba, Lagos, in 1956, where she learnt the rudiments of music, singing and piano playing. Mosunmola was a member of the School’s choir, which featured her in singing competitions at various Baptist Conventions, concerts and radio programmes. Professor Mosunmola was a student of Fela Sowande College (now Department) of Music, University of Nigeria, Nsukka in from 1963 to 1966 on Western State Scholarship. She was the first female to be admitted to the department. This was temporarily interrupted by the Nigerian political crises in 1966. She finished her degree program at the University of California, Los Angeles (UCLA) in 1968, on full Scholarship of Western State Government of Nigeria., majoring in ethnomusicology and music education. 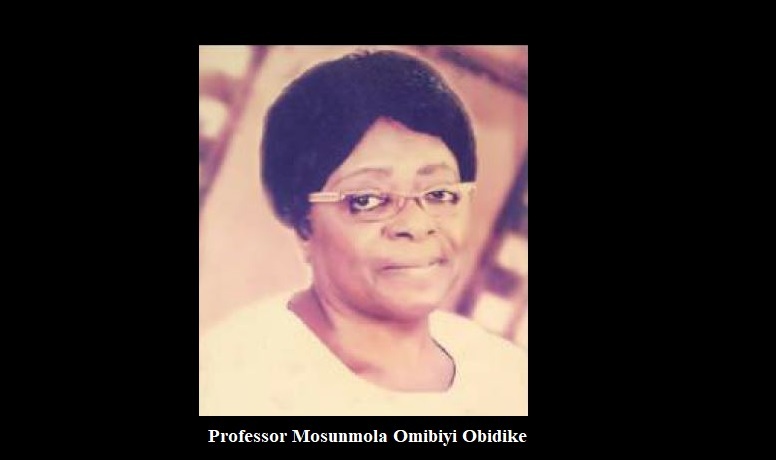 Professor Mosunmola Omibiyi Obidike obtained her master and doctoral degrees in African music educationin1969 and 1972respectively from the UCLA. Prof Omibiyi-Obidike got her BA in music (1968), MA in African Studies (1969) and PhD in Music Education (1972) from the University of California, Los Angeles. Professor Mosunmola was beneficiary of the Western State Government Scholarship from 1964 to 1968, and was also awarded University of California Scholarship in 1969. She was one Alexander von Humboldt Fellow between 1981 and 1982. Omibiyi-Obidike worked and eventually became a Research Professor at the Institute of African Studies, university of Ibadan, Nigeria, in 1989. Mosun's career was full of surprises and the biggest surprise was probably the contribution she made to the scholarship of modern African art music. In Nigerian and foreign institutions, she taught and gave lectures on the nature of African music, African-American music, Nigerian folk music, and the linguistic influence on music in Africa. On 2 January, 1978, she joined the University of Ibadan as a Research Fellow I in the Institute of African Studies; latter promoted to Senior Research Fellow in Musicology on 1 October, 1981 and got a promotion to the rank of Research Professor of Musicology on 1 October, 1989. A practitioner, she performed solo as well as in concerts and operas on many occasions. Professor Mosunmola had an outstanding solo performance in Ibadan in 1962, before an NBC-invited audience; and played a major role in the operetta 'The Sound of Music' in 1965. She gave multifarious solo performances in Los Angeles between 1968 and 1970. Professor Omibiyi-Obidike, “Mama African Musicology”, as she was popularly referred to, has served in different capacities as Consultant to Creative Arts of Africa, Black Studies Project, Department of Music, Fisk University, Nashville Tennessee USA, in 1974, and Ethnic Heritage Project Bowie State College, Bowie, Maryland, USA, from 1974-1975. Professor Mosunmola was a Member of Committee on Music for the Festival of Arts and Culture (FESTAC '77). She served as a Chairperson of the National Committee of the Nigerian Musical Instrument. She was as well a member of Women’s Research and Documentation Centre (WORDOC) of the Institute of African Studies, University of Ibadan and a Former Coordinator of the centre. She served as the Coordinator of the Nigerian Secretariat of the International Centre for African Music and Dance at the Institute of African Studies, University of Ibadan, an Institution set to coordinate musical activities in Nigeria. Professor Mosunmola Omibiyi Obidike was former President of the Association of Nigerian Musicologists (ANIM) from 2004-2008. Professor Omibiyi-Obidike was appointed Professor of Musicology at the institute of African Studies, University of Ibadan in 1989, thereby, becoming the first Nigerian and African Woman to be elated to that position. She was the Director of the Institute two times: 1995-1998 and 2001-2004. She has several articles published in Local and Internal journals and her two publications: Nigerian Musical Instruments and Children’s Songs from Nigeria- are in press. Professor Omibiyi-Obidikewas a recipient of several awards, scholarships and fellowships, including the University of California Regents and the Alexander Von Humboldt-Stiftung Foundation from 1981 to 1982 and between 2006 and 2007. The Fellowship of Alexander Von Humboldt-Stiftung gave Professor Omibiyi priviledge to conduct research in Germany and Europe on African Musical Instruments in European Muscums. Omibiyi-Obidike's works was published in books and learned journals like African Music, Pan-African Journal, Universities and Nigerian Magazine. She was a distinguished scholar with international reputation with over 70 publications in her field of her specialisation. The majority of her publications were focusing on development of music education, documentation of Nigerian music and musicians and cultural reconstruction. Professor Omibiyi-Obidike bid this world good bye on 6 May, 2016 at the age of 73. She was survived by children and grandchildren. Professor Omibiyi-Obidike has gone but her contributions to the preservation of the folk traditions of African music and dance, and her intervention to ensure that indigenous musical is forms and practices, remain the essence of the curriculum of music education in Nigeria and Africa, will not be forgotten. Phamox music is a music blog brand that provides information about classical music, hymns, African art music, art musician and hymnal. The main purpose of creating this blog is to provide useful and comprehensive information that worthy to be used as reference across the globe.